The former president's spokesman tweeted the message, accompanied by a picture of the 41st president's gravesite. Former President George H.W. Bush's Secret Service protection detail bid him farewell on Friday after he was buried in a private ceremony Thursday evening at the George Bush Presidential Library in College Station, Texas. In their final dispatch, shared on Twitter by the Secret Service as well as by Bush's spokesman, Jim McGrath, the detail used the former president's code name Timberwolf, likely for the last time. "You will be missed by all of us," the detail wrote. 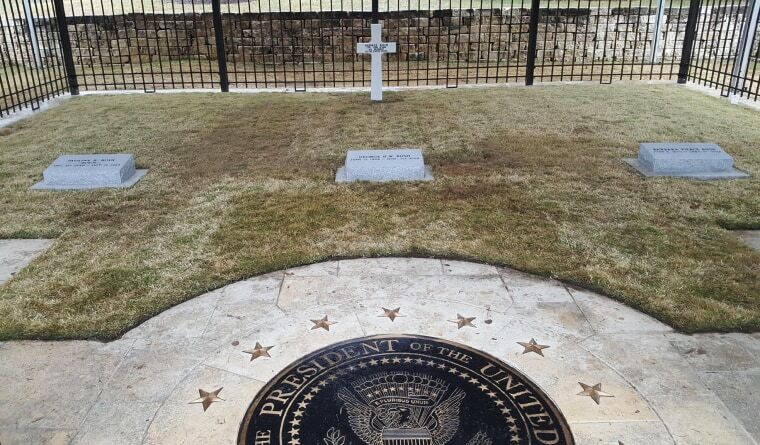 McGrath, in his tweet, offered a picture of the 41st president's headstone, located between that of his wife, former first lady Barbara Bush, and daughter, Robin Bush, who died of leukemia at age three. Bush was greeted at his burial site on Thursday by a 21-aircraft Navy flyover. The Navy executed what is known as the "missing man" formation, signifying the loss of an aviator. Typically, the flyover is limited to just four aircraft, but the military wanted to do something unprecedented for the former president, a naval aviator. The burial was a private ceremony, capping two days of public, state funeral events commemorating the former president's life and legacy.